I read a lot of fiction. In fact, I read almost entirely fiction, but I do try to read a variety of styles and genres. Then, I made a goal at the beginning of this year to not only spend more time reading, but to read things that will inspire me – including email newsletters and my Twitter feed- but most importantly, books. I’ve tried, and failed, a few times so far this year to read non-fiction books that I thought would help me to be more positive and grateful. They were books that I picked up but couldn’t get into. These books, which shall remain titleless, were dry. I had to force myself to read them and found my eyes growing heavy after only a few pages. I hate to not finish a book, but there are too many good books out there to spend my time forcing myself to read ones I don’t enjoy! Then, I found Brené Brown. Full disclosure, I found her through Oprah. She was featured on a two-part episode of Super Soul Sunday, a show I happen to enjoy. I didn’t expect to be moved, but I was. Fundamentally, Brené Brown is a researcher specializing in vulnerability and shame. If I had known this before seeing her on Super Soul Sunday, I probably wouldn’t have picked up her books. Who wants to read about shame??! I watched the first episode with Brené Brown on Super Soul Sunday, and after the second, I knew I HAD to read her books. 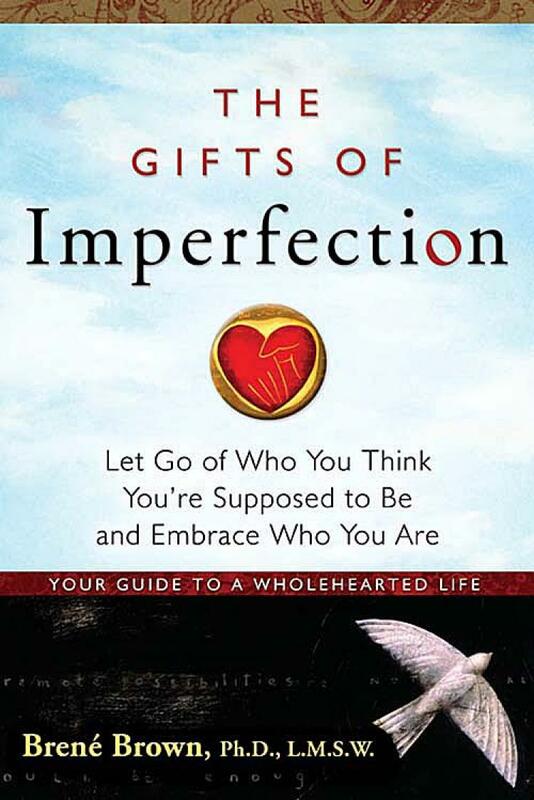 First, I picked up The Gifts of Imperfection: Let Go of Who you Think You’re Supposed to Be and Embrace Who You Are. She talks about embracing our imperfections, and offers guideposts to living wholeheartedly. I think this is something a lot of us can relate to. This is not my typical reading, but so much of what she says just hit me over the head! What I love about Brené Brown is that I never feel as though she is some lofty, Ph.D talking down to me. After watching her on Oprah (and eventually her TED talks as well) I had her straightforward, Texan voice in my head as I was reading. Brown says Wholehearted living is a process, a journey. We must decide every day to be our authentic selves. We must practice courage, compassion and connection in our daily lives. I am always downplaying the good things in my life, then find myself frustrated when others don’t seem excited when good things happen for me. How can they be excited when I’m the one downplaying it! Enjoy and celebrate the good things, and when things don’t go your way you can share in the bad as well. “Practicing self-love means learning how to trust ourselves, to treat ourselves with respect and to be kind and affectionate toward ourselves. This is a tall order given how hard most of us are on ourselves.” p 27. Self-talk is something I am working on so this really hit home for me. YES!! As a writer, I know this to be true! I don’t believe I can really do this book justice in one blog post, I truly can’t recommend it enough. I’m now reading her latest book, Daring Greatly. If you have read her work, I would love to hear from you! If you haven’t read any of her books, I encourage you to check her out on YouTube and see what you think! 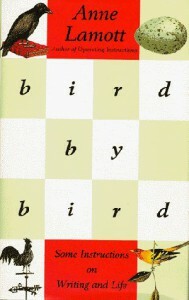 The first book on writing I ever owned is Anne Lamott’s Bird by Bird. I received it as a Christmas gift from my aunt when I was in high school and dreaming of becoming a bestselling novelist. I read the title and thought, “Why is she giving me a book about birds? ?” But when I read the full title I noticed it said: Bird by Bird: Some Instructions on Writing and Life. It’s a book I didn’t fully appreciate for a long time until I finally sat down and really read it. I have since re-read it many times and often pick it up to reference particularly helpful passages. I find that I discover something new each time I read it. Now, my copy of Bird by Bird is well worn. It has so many markings and underlined passages I couldn’t even begin to share them all. Lamott offers this bit of advice about getting started: write about your childhood. One of the first times I read this book, I took Lamott’s advice and I recently came across those writings I had written years ago, reflections about my turbulent years in junior high, a recounting of my awful first kiss. I was grateful to find these pieces, grateful that I had recorded these parts of my life that I’d much rather forget because let’s face it, it makes great material! Lamott writes about the writing life, and issues like writer’s block, and perfectionism. She offers ways to silence your inner critic (see the chapter on Radio Station KFKD.) She writes frankly and honestly about getting published (and the myth of publication) about which she says, “…if what you have in mind is fame and fortune, publication is going to drive you crazy. If you’re lucky, you will get a few reviews, some good, some bad, some indifferent.” She reminds us the real payoff is the writing itself. She writes about character, – it takes time for you to know them – plot, – Plot grows out of character – and dialogue, – good dialogue gives us the sense that we are eavesdropping. So much of that advice, so much of what I have learned about writing the hard way, is all written here in this book. Anne Lamott is funny and honest, sharing her own triumphs, tribulations and humiliations. Reading about her experiences reminds me that I’m not alone in those moments when I sit at my computer staring at the cursor blinking back at me, feeling as though I should just give up on writing altogether. Her stories have stayed with me, and have offered solace and humor in my own writing tribulations. If you are a writer this book is an absolute must-have. It’s the question writer Will Schwalbe asks his mother throughout her treatment for pancreatic cancer. It is a question that one can’t necessarily ask these days, for one can’t be sure someone is reading anything at all. 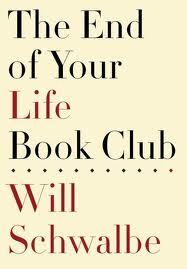 But in The End of Your Life Book Club, Will and his mother start a two-person book club that brings them together as they face the end of her life. Over the two years of her treatment, the books they read ignite conversations about life, faith, courage, gratitude and so much more. The books allow them to talk about things happening in their own lives, and help them to talk about death. The books they read are wide-ranging, from popular to classic, and include mysteries and poetry. Will’s mother is not an ordinary woman. We learn about the extraordinary life of Mary Anne who has a passion for helping others, and is devoted to helping refugees. She takes her love of books to new heights in her determination to build a library in Afghanistan where resources are so limited. With Mary Anne’s diagnosis, reader’s know how the book is going to end. But that didn’t stop me from crying openly at the end. In the beginning, I found myself anxious and slightly impatient, not with the book itself but with my own eagerness to read so many of the books mentioned in The End of your Life Book Club. Readers, never fear, there is an alphabetized list of the authors, books, plays, poems and stories discussed and mentioned throughout. You will not have a shortage of things to read once you have finished this book. The End of Your Life Book Club isn’t a book about death, it is about life and the life lessons we learn not only from the books we read but the conversations which are inspired by the books we read. I was left with a renewed belief in the transformative power of reading; the power of books to give us experiences we might not have otherwise experienced, to show us settings that feel like places we visited in another lifetime or wish to someday visit, and introduce us to characters who come to feel like old friends. Julia is an average eleven-year-old in a California suburb until suddenly the days begin to grow longer. The Age of Miracles is a coming-of-age story set against the backdrop of an altered world: the earth’s rotation has suddenly begun to slow. The natural world is thrown into chaos as time is added to each day and the time between sunrise and sunset continually increases. People must adjust to long, dark days and nights of blinding light not knowing if or when the earth’s rotation will go back to normal, plants begin to die from the changes in natural light, birds fall from the sky as gravity is affected. Dubbed, “the slowing,” suddenly the simplest things that seemed so concrete, such as the times of the sunrise and sunset are unpredictable and unknowable. Scientists are baffled – they can’t explain it or determine its cause. The world is forced to wonder if the end is near and yet, this is not a novel about the end of the world. Amidst all those changes, Julia is dealing with the normal struggles of an adolescent girl – the sudden distance of her former best friend, the strains in her parent’s marriage and the possibility of love. This may lead some to consider this a young adult novel, and while it may also appeal to younger readers, I don’t believe the age of this novel’s main character determines its audience. The story was compelling, thought-provoking and engaging. It is one of those books that draws you into its world so much you must readjust to reality when you put it down to return to your own life. It is a quiet, yet stunning novel that will stay with you. It was by far, my favorite book of 2012, and in my opinion, a must-read. I was drawn in by the voice; the first-person narration of The Age of Miracles is retrospective, the adult Julia looking back on the slowing. In the reading guide, Karen Thompson Walker says, “An adult looking back on childhood is always a story about a lost era; we can never be children again. That simple fact gives the voice an inherent melancholy and nostalgia that seemed exactly right for a novel about what might be the end of the world.” And I agree the voice is not only fitting but also works well to build suspense as Julia hints at events to come. The idea of the slowing and its consequences are thought-provoking. It got me thinking about all the apocalyptic stories we’ve heard over our lifetimes, fictional stories of deadly earthquakes,rapidly spreading disease or alien invasion leading to our ultimate demise. This story led me to the idea that perhaps the world won’t face a drastic and sudden catastrophic end, but rather a slow, demise from some event we never expected or predicted. The novel doesn’t seek to answer all the questions that it raises and leaves to mystery the science behind the slowing – and truly that isn’t what this novel is about. If you’re looking for a science-fiction, end-of-the-world novel this isn’t the book for you. But rather, this novel shows us how life goes on in the face of global change. I look forward to reading whatever comes next from this debut author. I was drawn to this book because of the moral dilemma at its core: Could a couple who couldn’t have children of their own really take in a child whom they found in a boat washed up on their shore without regard for the family that might be searching for her? The Light Between Oceans is the story of Tom Sherbourne, a lighthouse keeper on a remote island off the coast of Australia, and his wife Isabelle who has suffered two miscarriages and a stillbirth. When they discover a boat washed up on the shore carrying a dead man and a baby who is very much alive and healthy, they make a decision to keep the child and claim her as their own. Their decision comes into question when they discover the child’s mother is still alive and searching for her missing husband and daughter. But Isabelle is desperate for a family, and when Tom sees how happy the baby makes her, he doesn’t report the incident, going against his duties as a lighthouse keeper. Instead, he buries the body of the man in the boat, and with it, he buries the truth. The island is an ideal setting for the novel – a cocoon where the Sherbournes can safely keep their secret and live as a normal family. When they finally leave the island for the first time in two years and head back to the mainland, they finally hear the story of the man and baby who went missing two years ago and the woman who is still desperately searching for her family, clinging to the hope they are still alive. Tom and Isabelle must decide if they will reveal the secret they’ve harbored for the past two years. Keeping their secret means keeping a child from it’s mother, leaving a woman a lost soul with questions she will never have answered. Revealing the truth means they will surely lose their daughter Lucy, and with it, their only chance at having a family of their own. This novel kept me turning the pages. What made the story so compelling was that everyone had a stake in the outcome; not only the Sherbournes, but also the daughter they wanted so badly they’d do anything to keep her, and the mother who wanted her child back. It is an impossible situation of mistakes and their consequences, one where there don’t seem to be any right answers. The book is not without its faults. The beginning is bogged down with backstory, the middle is drawn out, and some awkward prose throughout the novel is distracting, though somewhat forgivable, for a debut novel. Ultimately, the story is an interesting and thought-provoking read. Do not look to this book expecting a happy ending, as there are no easy answers in this emotionally-charged novel. What you will find is a haunting story that may break your heart. As I look back at 2012, I realize it wasn’t a good reading year for me. Planning a wedding took up much of my free time for most of the year, at least that’s my excuse, but I’m still surprised by the unusually short list of books I read this year. I may have forgotten one or two along the way, and I didn’t include rereads, such as Janet Fitch’s White Oleander, one of my favorite books of all time, which I read for the third time a few weeks back. The first book I read in 2012. “War Horse” is based on a true story about a horse named Warrior. It tells the story of Joey a horse purchased by the Army for service in World War I France and the attempts of young Albert, his previous owner, to bring him safely home. A touching story. This is not a story about September 11th, but a story of the aftermath of tragedy, living with loss and the search for answers. Nine-year-old Oskar Schell discovers a key in a vase that belonged to his father who died on 9/11. He believes his father left the key for him as a clue and he searches all around New York for information about the key. The joy in this story is in the people Oskar meets on his journey. It is heartwrenchingly sad, very emotional, but powerful, I couldn’t stop thinking about Oskar long after I put this book down. I saw the movie version and cried like a baby. I was skeptical of the Hunger Games series, as I am with most overly-hyped series, (i.e. Twilight) I expected nothing more than a mildly entertaining read, however, the entire series is suspenseful and interesting. For those who may be skeptical as I was, or who may think it’s no good because it’s categorized as young-adult lit, I encourage you to give the books a try. Mystery thrillers, these selections were a little out of the norm for me. However, they were both entertaining, page turners. Second Glance is a ghost-story in that the plot is based on mysterious happenings in a small Vermont town that begin when a developer is slated to build a strip mall on an ancient Abenaki Indian burial ground. But at its heart, Second Glance is ultimately a story of love and family. Though the paranormal subject matter strays from Picoult’s typical topics, her story is still compelling, her characters in-depth (despite the number of them) This book may require a bit of patience on the part of readers. Ultimately, Second Glance was a fun, interesting, read. Just don’t bring it to the beach and expect to whip through it in a day or two. A memoir of an amateur hiking 1,100 miles along the Pacific Crest Trail and coming to terms with the path her life has taken. Told in a voice that is blatantly honest, it is, at times, funny, and raw – particularly in the sections where she talks about her mother’s death. I turned to this book expecting an easy yet engrossing read which I have come to expect from Hannah. It was a much darker book than I expected, telling two parallel stories, one of two sisters in the present, and one in the past of their mother’s life which the sisters know nothing about. In this book, Hannah shifts from contemporary issues to take on the past, specifically, Leningrad during World War II. Hannah’s story set in the present is not as strong as the story set in the past, but it is an interesting book nonetheless, and the story will haunt you after you have put the book down. A lighthouse keeper on a remote island off the coast of Australia, and his wife who cannot bear children discover a boat washed up on the shore carrying a dead man and a baby who is miraculously alive. They decide to keep the child and claim her as their own. Their decision comes into question when they discover the child’s mother is still alive and searching for her missing husband and daughter. I’ll be reflecting more on this book, check back for a more in-depth review. This may be my favorite book that I read this year. The Age of Miracles is a coming-of-age story set against the backdrop of an altered world: the earth’s rotation has suddenly begun to slow. I will also be a more in-depth review of this book in an upcoming post. If I have a New Year’s resolution, it is to read more in 2013! What was the best book you read this year?